hey were once “the hottest band in the land.” Now – with the release of Alive II – KISS is “the hottest band in the WORLD”! Between the last Alive! (Sep 1975) and this one, the rollercoaster had only gone up. And up and up. In Feb 1977, KISS had at last graduated to headlining arenas in the States, including the iconic benchmark of success, Madison Square Garden; in Apr 1977, they sold out four shows at Budokan Hall in Japan, beating The Beatles record; in Jun 1977, they released their platinum Top Ten album Love Gun, as well as the Marvel KISS comicbook… No more pussyfooting – at this point in their career, KISS were bigger than the Beatles who were bigger than Jesus. 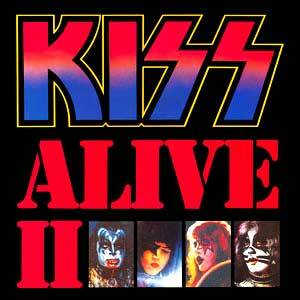 Alive II is the 8th overall album by KISS (and the 2nd live album). When you think about the frequency of albums, it seems inhumanly quick. Merely two years ago, they had released their first live album. In the interim, they had released THREE studio albums! In total, in the three-and-a-half years since their first album release (Kiss, Feb 1974), they had released SIX studio albums and TWO live albums! (And this second live album contained five new studio tracks! It’s a good thing they were superhuman gods that didn’t need to eat, sleep or make sweet love by the fire!) Is it any wonder the lazyboneses of the band were weeded out in this first phase of KISS-teria? 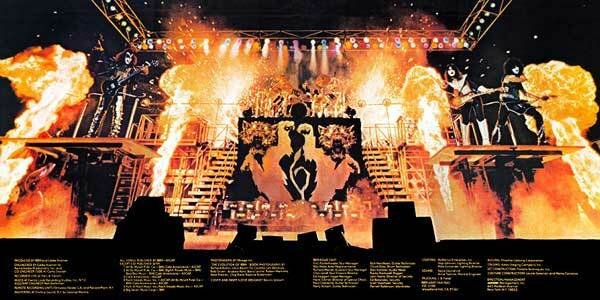 Alive II: The greatest gatefold sleeve on Earth and other planets. 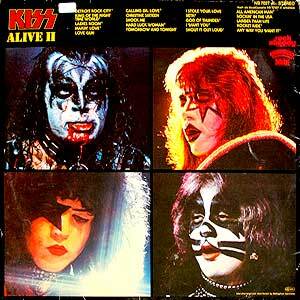 The bulk of Alive II is recorded “live” at The Forum in Los Angeles, California, on August 25-28, 1977. (I say “live” because we know it’s been doctored. Or Dr. Loved, due to a case of – rock and roll pneumonia.) A few tracks were recorded at the Capitol Theatre, Passaic, New Jersey, and at Budokan Hall in Tokyo, Japan. Selections are from the latest three KISS albums (Destroyer, Rock And Roll Over, Love Gun). Since these three did not suffer the inferior production of the first three, their live renditions didn’t add any sonic quality, and in the case of Destroyer – with its HUGE slickness – the live versions didn’t even match the sonic quality achieved on Bob Ezrin’s postcard to the cosmos. For example, this thin stage version of God Of Thunder is not a patch on the ominous soultaker on the studio album. Notable tracks: Makin’ Love, where the delay effect on the chorus is replaced by Stanley hitting that high B – a spectacular substitution! Shock Me, which Ace sings in his unsure voice, then launching into a short guitar solo. I guess the visuals of smoking guitar and shooting rockets from the neck and levitating guitar didn’t really work as “audio only,” so we only get the “playing” parts – until Paul’s closing yell: “Yeah-heaah! Ace Frayley – lead gitawr – Shock Me!” And within God Of Thunder, there is a short drum solo, that sounds like Peter Criss warming up and then NOT playing a drum solo. Guess you had to be there. Criss sings the orchestrated Beth to a backing track. The concept was not to repeat anything that was already on Alive! so Shout It Out Loud is the big closer, rather than, you know, that song that everyone knows KISS by. But now, uuh, we don’t have enough material for a double album, guys… thus Side 4: five new studio tracks. 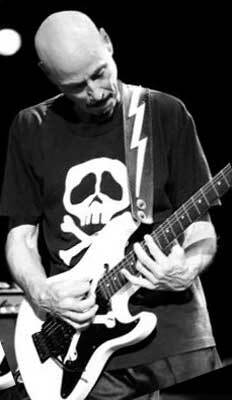 Bob Kulick: the skull that shook the world. All American Man. That ain’t Ace! On Paul’s slamming paean to the top of the food chain – “I’m a six-foot, hot luck, all-American maaan!” – we hear a pile-driving lead solo in a style so unlike Ace’s, we accidentally buy Frampton Comes Alive! It’s Bob Kulick (Meat Loaf), whom KISS tried out in the cattle-call of guitarists before Ace landed the gig. Reason why Bob didn’t get the job: bald. KISS (Stanley and Simmons) had a vision that Bob didn’t fit, but his professional contact with them through the years would pay off in myriad ways. Rockin’ In The U.S.A. Simmons salutes the flag. And Kulick once again puts down some tasteful guitarwork. Larger Than Life. A massive drum sound accompanies Gene’s cosmic journey into his pants. Reportedly, Peter Criss played on all these studio tracks, but by the sound of those drums, I’m dubious. KISS producer Eddie Kramer claims it’s Anton Fig. I believe him. Kulick once again in attack mode, ice-picks and javelins. To hold up Gene’s massive trousers. “You can’t believe your eyes / What you heard weren’t lies / My love is too much to hold…” Hmm, I wonder what he’s talking about? Rocket Ride. Ace Frehley eventually comes out of his card game, to take us on a cosmic journey – into his pants. It’s worth the wait, as he nails down a phased dirty riff and then ricochets a spiffy arpeggiated wah-solo off it; the timbre of his vocals somehow “matured” since his effort on Shock Me, yet with lyrics as subtle as lightning bolts: “Baby wants it fast / Baby wants a blast / She wants a rocket ride / She wants a rocket ride…” Hmm, I wonder what he’s talking about? Paul Stanley closes the album with The Dave Clark Five cover Any Way You Want It. Don’t know why. 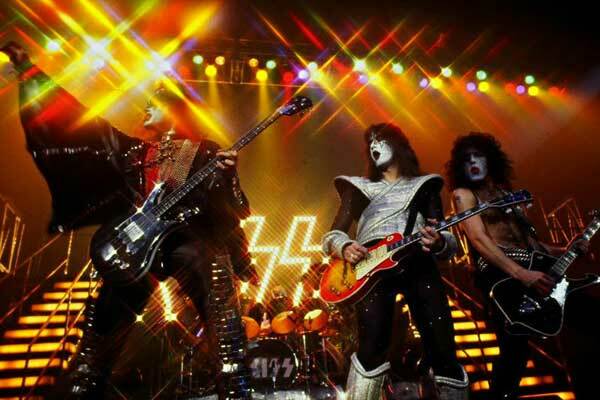 Meaning, Stanley – who basically did the song himself, performing all guitars and vocals – chose to get right up close to the original’s 60’s sound, instead of putting the KISS stamp on it. Promotional items within the album sleeve included a full-color booklet, The Evolution Of KISS, a set of temporary tattoos, and – here we see the train leaving the station – a merchandise order form. Taking advantage of the popularity of the band, Paul Stanley and Gene Simmons turn their attention to the trinkets that would eventually grow to 3000+ licenses, from the KISS Kondom to the KISS Kasket. In Stanley’s/Simmons’ words, “We’ll get you coming or going. From sperm to worm.” It has begun. Released: October 1977, Casablanca Records. 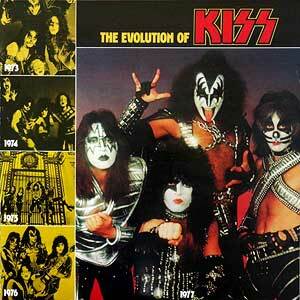 Produced by: Eddie Kramer, KISS. by Jon Dunmore © 30 Nov 2015.